The most wonderful wedding venue ever! I am not big on writing reviews, but I had to write one for this place. 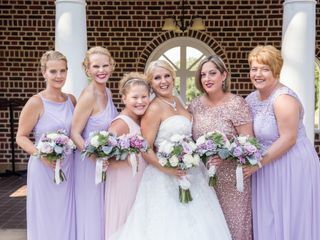 We had my daughters "wedding weekend" there a month ago. I call it wedding weekend because we had the rehearsal and dinner Friday night,and most of us stayed until Sunday. Rachel walked us through the rehearsal outside as we planned to have it, but also in the mansion in case of rain. Then we went down to the patio outside of the restaurant for the back yard bbq dinner. Everything was wonderful! We stayed later than I'm sure the staff planned on. They were wonderful about it. They put the rest of our champagne punch in a pitcher for us and even brought lanterns out to us as they left for the evening. We all went to a wonderful breakfast the next morning before starting our day. Sadly it did rain for the ceremony, but again the incredible staff lead by Rachel got the mansion set up quickly and efficiently. It wasn't what we planned, but we were so happy there was a plan B for us. The cocktail hour was amazing. Rachel added a lot of little touches for it as well as the tent reception that followed. The food at the cocktail hour and the reception could not have possibly been better. I had many tell me it was the best food they ever had at a wedding. Everything ran so smoothly even with our weather glitch. And again the staff at Linden Hall is fantastic. This was our youngest daughter, so our third wedding, and it was by far our favorite. The other two were beautiful, but this one was fabulous. If I were to host another, I would absolutely have it here again. My one friend told me that next week that she's been to a lot of weddings and this was the most beautiful one she ever attended. Anyone considering here should put all doubts out of your mind and book it. You will never find a more wonderful venue! I wish I could have thanked every staff member, but I'm so very grateful for Rachel. You are amazing!!! Thank you for making our dreams come true!! Rachel Swink at Linden Hall is a goddess and a dream come true, and I don't care how cheesy that sounds! She was truly so easy to work with, answered all of my million questions, and gave me great advice along the way. She was a godsend on the day of the wedding and went above and beyond for my hubs and I & all of our guests. She kept things running smoothly and I felt so calm knowing she was there for us! 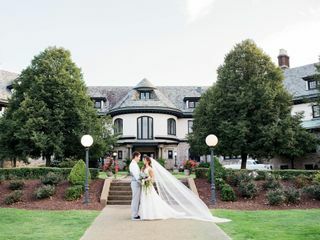 We had both our ceremony and reception at Linden Hall and it was the most incredible day from start to finish. 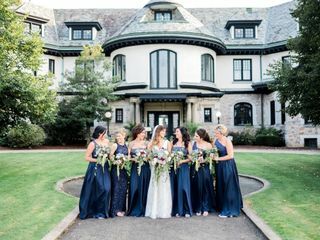 Linden Hall is such a beautiful venue- I love that you get the beautiful mansion for formal photos and the gorgeous grounds for more natural shots with greenery! Truly, it's the best of both worlds! All of my guests have raved about how delicious the food was, and I truly would not change a thing if I could go back- and I feel like that says it all! I would give 1 million stars if I could!! We looked at many places for our wedding and was torn between two places. The moment we met Rachel, we knew Linden Hall was for us. The grounds are beyond stunning and Rachel just takes it to the next level. Our wedding was in July and it was more than I could have ever dreamed of. Rachel was calm and kept us on track and never left our side. I can not say enough on how amazing she was as well as the staff. We had so many complimenting on how amazing the food was and how awesome the staff were. Our guest are still talking about it months later. We just can not thank Rachel enough for everything she did for us on our day. If you are looking for a dream day with no stress and wonderful staff, food, drinks, and memories, Linden Hall and Rachel are for you!!! I had my wedding in the large tent they have set up outside the hotel below the mansion and I could not have picked a better place!! Where to start?? The food was just mouth watering. Rachel, the on-site wedding coordinator, was absolutely wonderful! She was available to answer any questions that I had (which was all the time) and if I ever seemed stressed on the phone she was always ready to calm me down. The entire staff was incredibly friendly and helpful and the price was very reasonable for as classy as the place is! The photos we took in the mansion and gardens made for amazing photo ops and Rachel had too many surprise special touches for me to mention. I almost wish I could get married again just to have another wedding there! The location is beautiful. All the employees were just WONDERFUL ! Bonnie, Jim, Julie, all the servers and maintenance employees, hotel employees were professional and wonderful to work with. The food was outstanding at the rehearsal and wedding reception ! Service was excellent. We could not have found a better place and people to work with to make our daughters and son-in-laws wedding celebration a day to remember. simply majestic and filled with such class and finesse it bespeaks to a time of grandeur and sophistication long since forgotten. The wedding coordinator Bonnie would not have been more warm, accomodating and kind everything went off flawlessly. I can still remember vividly every moment of our special day. We felt like royalty as we processed down the pathway to the gardens for the ceremony, then a grand cocktail hour in the library with its magnificent marble fountain, the panelled library and gorgeous interior. Our dinner reception was executed with the utmost precision and care. the food sumptuous, the service attentive and the entire venue was like being in one of the royal residences of England. I would highly recommend this venue too all who are looking for that very special place to have their wedding and to be able to trust and be confident that there every wish , hope and desire will be met perfectly We plan on returning this June for our one year anniversay to recall the splendid place. Thanks to all who made our day so grand. Beautiful venue for a southwestern PA wedding. 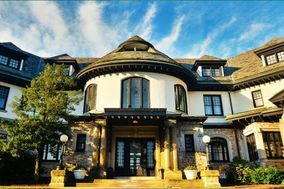 Wonderful outside views and the inside mansion for the reception is gorgeous with early 1900's furnishings. Everything is included in one price per person. They take care of food, alcohol, set up and tear down. Worth a look! We had looked at several venues before Linden Hall but as soon as we arrived for our visit I knew right away it was the place for us. We immediately fell in love with the charm and beauty of the mansion house. We loved how once our guests would arrive they wouldn't have to leave, we had the reception outdoors at the bar area, the accommodations were at the lodge which is on the premise and we were even able to have the lodge bar opened after the reception. I cannot tell you how many guests told me that Linden Hall was the nicest and classiest wedding they had ever been too. Despite most wedding food tasting like cafeteria/airplane packaged meals the dinner at the reception was top notch! The portions were very large and by the end everyone again, was complimenting on how good the food tasted. The staff could not have been any nicer or more accommodating to every single one of my guests. The costs were affordable compared to most of the venues we visited and easy to handle since the food/drinks are tied into one package. Our wedding was a magical day and Linden Hall contributed to making it extra special. Highly recommend!!!!!!! 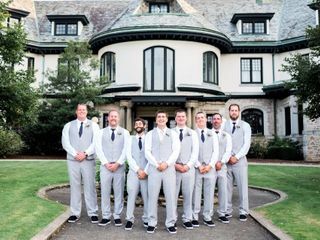 As soon as we walked into Linden Hall, we knew it was the place for our wedding. We had an outside wedding in the courtyard that was absolutely amazing! It was very convenient for our locat and visiting guests due to the hotel and location. We were served a surf and turf dinner that was delicious and tasty and all our guests loved the food along with the service. Linden Hall is an absolutelyl amazing place! We can honestly say nothing negative about it! The wedding planner, Bonnie, is so incredibly sweet and extremely helpful! We were more than impressed with the facility and all of the naturaly beauty that it has to offer! Thankfully the weather was just gorgeous & we had a beautiful ceremony in the garden! All of the staff were just extremely kind, considerate, and full of compliments that just made our special day all the better! 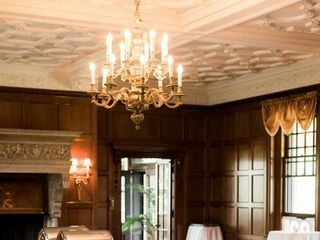 We would highly recommend Linden Hall to anyone! The grounds are amazing from the beautiful garden, to the mansion, to the banquet hall. The food was exellent & we had a ton of compliments! You cant beat the hotel right on the grounds either!!! It is just a great place! I received rave reviews on the food, atmosphere, and service. It was already decorated for Christmas so I didn't need much. Actually just the beautiful artifacts made it extra special. They do have rules about guests roaming around where they don't want people. Inside the great hall (mansion) is smaller for a wedding. So if you want a larger wedding it would have to be held outside or in another larger area and the reception at their other ball room in the hotel. My reception was held in the ball room in the mansion. I had about 85 people there. It was so elegant and exactly what I was looking for. Hotel on site was perfect for us. Their website provides packages that you can view and what they provide w/ each. The woman who was there when I had my wedding was very nice and helpful. Cons: In the middle of nowhere. We had to travel up to the mall to get our hair/makeup done. I'm sure you could get someone to come to you. So if something was quickly needed, you had to travel some to get it. Also, this is not a cheap place to have a wedding. There was a local florist in Dawson who did a fab job. Absolutely loved getting married at Linden Hall. We had a ton of out of town guests and everybody was able to stay there. We had a garden ceremony and held our reception inside the mansion. Everything was fantastic. We want to go back and do it all over again exactly the same because it was so fun, so beautiful, just amazing. I booked my ceremony and reception to be outdoors and Linden Hall did all that they could to accomodate my requests. The tent was beautiful and exactly what I wanted. From what I was told the food was some of the best that my guests had ever had at a wedding, but being the bride at a 250 guest wedding I wasnt able to enjoy it as much as I would have liked, through no fault of Linden Hall. I would definitely recommend Linden Hall for anyone looking for a beautiful ceremony/reception site. My pictures turned out beautifully thanks to the amazing scenery and I couldnt have asked for anything better. Thanks again! !